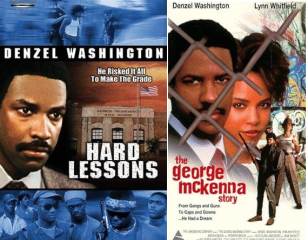 The tag line of the film “The George McKenna Story” (also known as “Hard Lessons”) is a punny George McKenna-ism characteristic of the man it profiled. “He risked it all to make the grade,” is how the movie was advertised. In it, the heroic principal sacrifices relationships, career and safety to do the right thing for public education. The movie kicks off with a funky, if not dated, original score written by jazz great Herbie Hancock. The scroll states, “Based on a true story,” and according to McKenna himself, it’s all pretty accurate and happened just like it unfolds in the movie. Within a few minutes of being at the school, McKenna has to break up a gang “jumping” ritual and literally put out a fire started in the hallway. He tries to encourage a handful of teachers to do more for their students but meets resistance, particularly from a teacher named Ben Proctor (not a real person) played by character actor Richard Masur, known for TV shows such as “Rhoda,” “One Day at a Time” and more recently “The Good Wife.” The teacher expects McKenna won’t last and later reports him to the district on trumped-up charges. Meanwhile, students are skeptical of the new principal. One smart young girl wants to leave the school and get bused to a safer school an hour away. A gang leader on campus gets arrested, and McKenna tries to help him. He drives a good student to his home and finds out he’s living in an abandoned car and is undocumented. He also confronts a father who would rather his son work with him at his business than go to school. Then a promising young athlete is shot on campus in a gang fight and dies in McKenna’s arms. (It was shown on campus, but actually occurred just off the school grounds.) That motivates him to step up changes on campus, calling for a dress code and for teachers to check in with parents. He holds a meeting for parents, but only 16 show up. Parent activist Margaret Wright, played by singer Virginia Capers, warns him, “I got you hired, I can get you fired.” There is now a building on campus named after Wright. 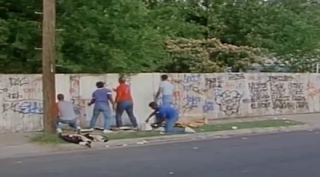 He paints off the graffiti on the wall across the street from the school, and keeps painting over it, until he gets the football team to help him. 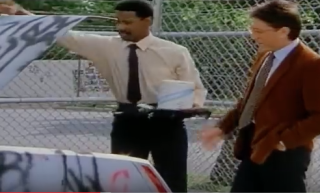 Allan walks to the parking lot where McKenna’s car is vandalized with graffiti. Later, a district official notifies the new guy that he can’t change the system. McKenna then hires an inspiring English teacher, Aura Kruger, who gets the students to learn Shakespeare. She is played by tall, upright actress Barbara Townsend, when in reality the actual teacher was barely 5 feet tall and weighed 95 pounds. She wanted to bring a regional Shakespeare competition to the school, which McKenna accomplishes, despite fears from the other students attending. One of her students performs an amazing soliloquy at the contest after almost giving up. McKenna (who is officially George McKenna III) goes back home to New Orleans to talk to his father, who gives him a pep talk and sage advice. By the end of the movie, the teachers who don’t like McKenna leave the school. His girlfriend realizes he is more wedded to public education and leaves him. The wall across from the school remains graffiti-free. Watch the trailer of the movie below. Find out more about George McKenna here.